Do you ever find yourself questioning your life and how you got to that point? The mundane everyday tasks can become repetitive and make you miserable to the point where you may just lose your mind and snap. In the horror short, Familiar, John Dodd comes to his breaking point but he soon realizes that his evil thoughts may not be his own. 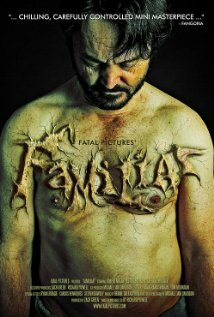 Familiar follows the lives of John Dodd (Robert Nolan), his wife Charlotte (Astrida Auza), and their daughter Jordan (Cathryn Hostick) as they painfully trek along. 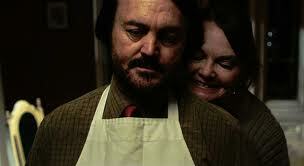 The film mainly focuses on John’s angry thoughts regarding his pathetic life and his hatred for his wife. John is miserable with what he is has to deal with and is unhappy in his marriage, however, he doesn’t ever express his feelings vocally; he keeps all of his emotions bottled up inside of him, letting them build and grow stronger. When his wife becomes pregnant, he lets his evil thoughts coerce him into buying a medication to abort the situation, without telling his wife, of course. This later results in a worse situation for John, who must now deal with a depressed wife who just wants to try again for another baby. The pathetic sap doesn’t want to have another child and he knows that his wife will never stop until she gets what she wants. He realizes that there’s only one way to deal with the situation and make the problem go away for good. John’s mind insists that the only way out is to murder his wife but when he actually tries to do it, he can’t. This results in his mind–which is filled with evil thoughts—to try to break away from his body completely. To his dismay, John wakes up one morning and finds that there’s an evil growing inside of him, trying to get out and that only he can stop it. I’m not particularly a fan of short films because I find that they are hard to get into and usually there isn’t enough time for character development, so the audience doesn’t get to know who they are watching. However, that wasn’t the case with Familiar, which was extremely well done and enjoyable. The protagonist, although slightly crazy, was very likeable and intriguing. I found him to have similar qualities to the character of Jack Torrance in The Shining and I couldn’t look away from him while he was on the screen. The director and writer did a great job at creating sympathy for his character, feeling the pain he was going through, and I found myself rooting for him to get rid of his annoying wife! I enjoyed the creativeness in the idea that the evil within John was actually a separate entity and it was fighting to get out. The final scenes where he takes action to remove the evil were super creepy and cringe-worthy. The message I got from the whole film was that if you just sit there and let your anger build, without ever talking about your problems or taking legitimate (and legal) actions to fix them, then they’re only going to build and become a lot worse. In John’s case, he dug himself into a deep whole and couldn’t get himself out because he let his anger pretty much get the best of him. The performance by Robert Nolan was praiseworthy; he barely spoke on screen but he conveyed so much anger and resentment through his eyes to the point where you could see just how unhappy he was. His voice, which is mainly heard through his thoughts, was also very alluring as well. I’m definitely looking forward to seeing him in more films in the future. I was pleasantly surprised by this film, which didn’t feel like a short film to me. The only problem that I had was that it wasn’t a full length feature, because I would have enjoyed seeing the story fleshed out more and see just how far John was going to go. This 20 minute horror short is definitely worth a watch for a horror fans.